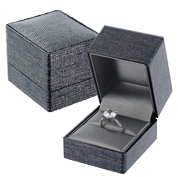 Discover high-quality charcoal grey gift boxes and showcase your collections in style! These items are made of a luxury woven texture in metallic charcoal grey tones with an elegant & soft touch. Perfect for showcasing your precious jewelry collections in style!